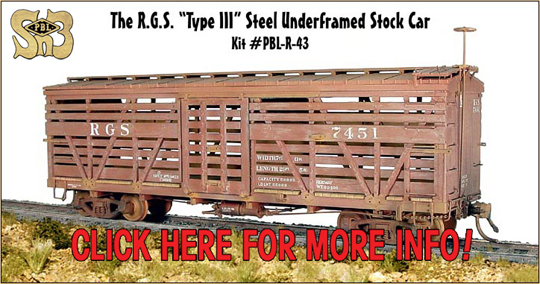 If you're into FineScale Railroad Models, this link'll get you to P-B-L's Rolling Stock Page - We now have 30 - Painstakingly Researched, Prototypically Correct All Injection Molded Rolling Stock Kits, with more still to come ! 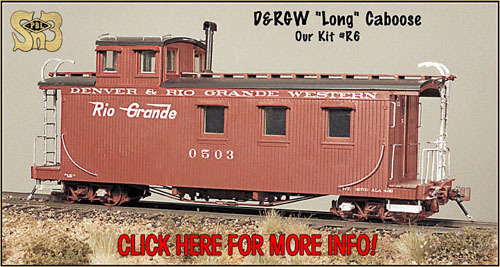 Click here to see some of the finest detailed D&RGW, R.G.S., S.P. 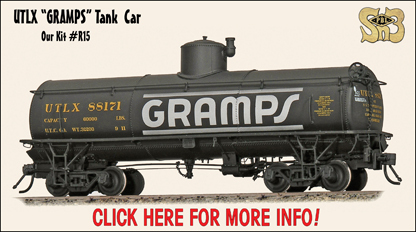 Narrow Gauge and Westside Lumber Company models on the planet! And they're available right now! Exactly what you've come to expect from P-B-L ! 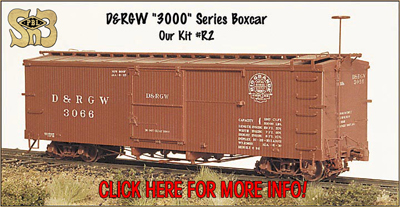 We now have 30 - Painstakingly Researched, Prototypically Correct All Injection Molded Rolling Stock Kits, with two more to be released soon! Each of these kits has been Painstakingly Scaled from the Prototype, and each includes the proper, accurately scaled trucks which feature our superb Proto-Wheeled Coined-with-Ribbed-Backs and "GRIFFIN DENVER" Faces, free rolling nickel plated brass wheelsets! Click Here to have a look at some! Magazine reviewers have noted, time and again, that we have the most complete assembly instructions in the business! The latest iterations of which even have CAD plus 3-D generated illustrations! Wonder of wonders, these kits are actually buildable, and you don't need a masters degree to complete one either! Click on any icon below for more info! West Side / Swayne "Skeleton" Log Car. Body and Details are "White Metal", All holes pre-drilled! Kits include Nickel Plated Brass Wheelsets and Genuine Kadee ® Couplers ! This has been our most popular kit. It's an all injection molded piece of work that outstandingly replicates the real thing ! Complete with highly detailed, step by step instructions, Nickel Plated Brass Wheelsets and Genuine Kadee ® Couplers! Unbelievable Detail, far more "Fine-Scale" than anything could ever be in wood 'cause you can only "scale" wood grain "so small". . . Injection Molded w/Nickel Plated Brass Wheelsets and Genuine Kadee ® Couplers! 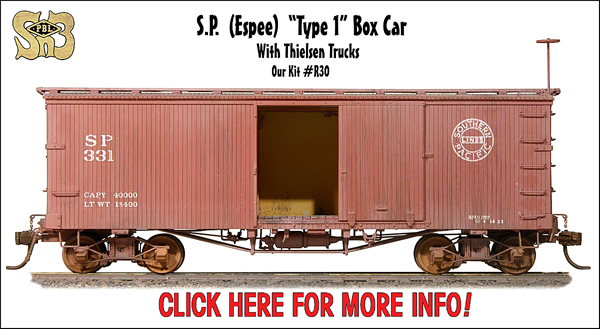 These cars were made by cutting down "3000" Series Boxcars and were used in "Pipe Train" service. Includes real weathered rail for stiffening, just like the prototype! Injection Molded w/Nickel Plated Brass Wheelsets and Genuine Kadee ® Couplers! 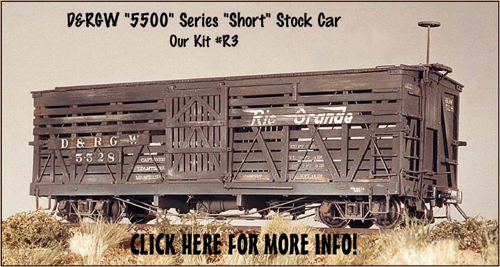 "The Grande" had more gondolas ( or "gons" ) than any other class of revenue car. And that ours does justice to the intricacies of the prototype is no exaggeration. Injection molded w/nickel plated brass wheelsets and the genuine article, real Kadee ® Couplers! This model is scaled down so amazingly that it even has a Complete Interior with every board, even every hinge present and accounted for ! It even has movable bunks! Injection Molded, of course, with accurately scaled trucks, nickel plated brass wheelsets and Genuine Kadee ® Couplers! 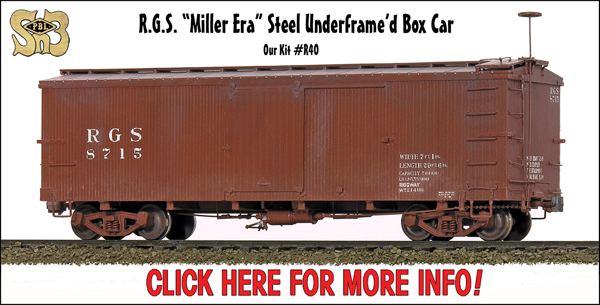 Cut down from "broad gauge" flats, these flats were "heavy haulers", for sure! Click on the photo for an enlarged view. Another all Injection Molded Kit w/nickel plated brass wheelsets and the real-deal, genuine Kadee ® Couplers! Some of the "6500's" got bulkheads, as you can see. Our kits are injection molded in high impact plastic so they go together "as advertised". We even modeled the trucks accurately ! Complete w/nickel plated brass wheelsets and Genuine Kadee ® Couplers, of course! 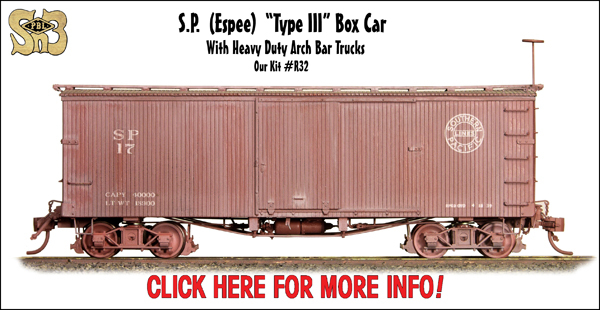 Complete with the fragile looking "long wheelbase" trucks of the prototype, you need to click on the photo for a good look at this miniature ! Another all injection molded kit w/nickel plated brass wheelsets and Genuine Kadee ® Couplers! 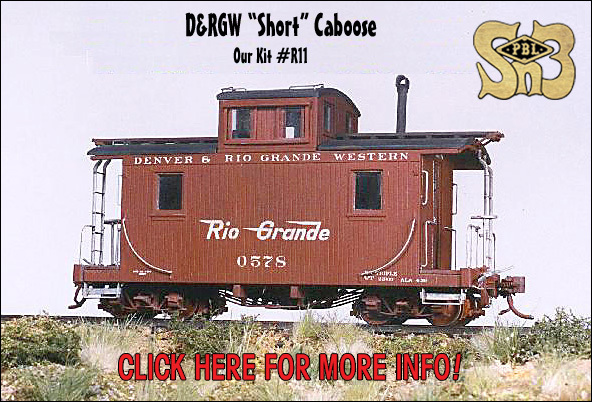 D&RGW "1100" Series "Hi-Side Pipe Gon"
These were converted from Hi-Side Gons for "Pipe Train" service. Complete with the unmistakable "afterthought" brakewheel, staff, and brackets, these cars simply scream NARROW GAUGE, don't they? Injection molded w/nickel plated brass wheelsets and Genuine Kadee ® Couplers! 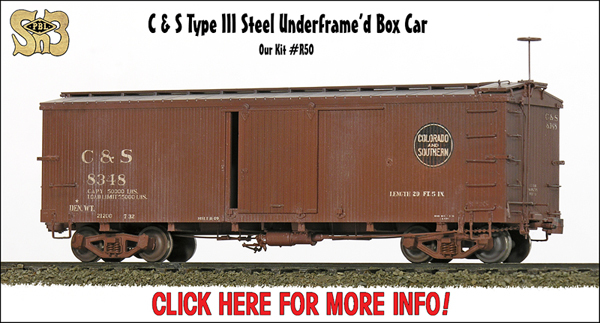 Like our long caboose, this model also includes a Complete Interior! Cupola Windows Slide too! Superb! Another injection molded kit w/nickel plated coined brass wheelsets and Genuine Kadee ® Couplers! We call this our "Super Box" because it includes positionable doors and a detailed interior! Another injection molded kit w/nickel plated brass wheelsets and Genuine Kadee ® Couplers! 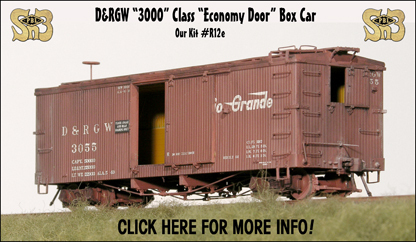 A variant of our "regular" or "reinforced-door" boxcars, this is also one of our "Super Boxes" because it includes positionable doors and a detailed interior! Click the photo for an in-depth look ! Another injection molded kit w/nickel plated brass wheelsets and Genuine Kadee ® Couplers! 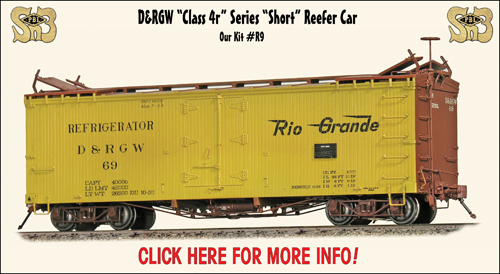 Equipped with special "Cast Steel" trucks shared only with the "Long Reefer", a few of these beauties will fit right in for those Spring and Fall "Stock Rushes" ! Another injection molded kit w/nickel plated brass wheelsets and Genuine Kadee � Couplers! The highest level of detail ever achieved in a production model! Don't believe it ? See for yourself ! Click on the photo and follow the links! Another injection molded kit w/nickel plated brass wheelsets and Genuine Kadee � Couplers! 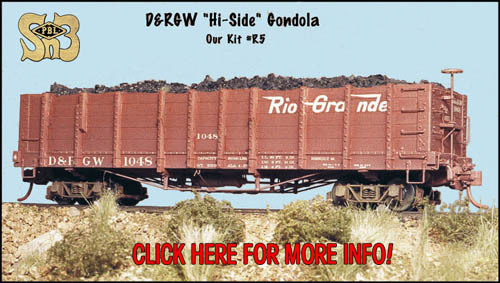 A 40 foot flat car for the narrow gauge? And a wooden one at that? Well sir, that's what this model represents... And not one, but TWO very distinct versions have been created besides! CLICK PHOTO FOR MORE INFO! So if you model the pre-1937 period, this is the ONLY version for you. But if 1937 and later is your period, then you can have BOTH versions... Take yer pick! No, the picture didn't get "stretched" somehow. The 'Grande really did have such things as these 40'-0" wonders! 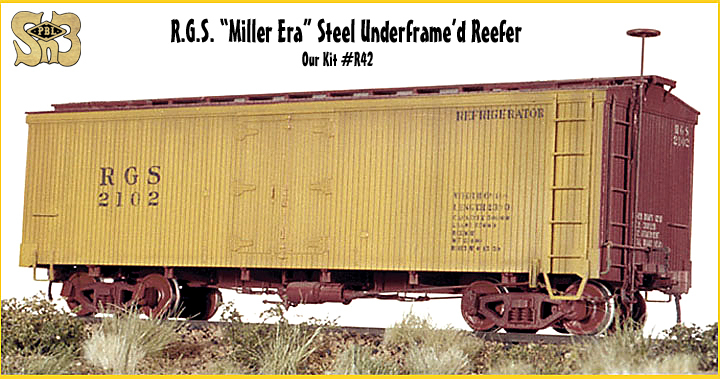 Probably because, what with the "ice bunkers" taking up gobs of space, the "short" reefers just didn't have quite the capacity. All injection molded and sitting on the special "Andrews" Type trucks of the prototype with our great rolling brass wheelsets, and Kadee ® couplers. These unique "Heavy Duty" Flats had an interesting history. We've a special page just for them. Click on the photo to visit it! 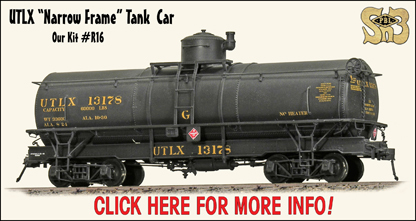 These "Type III" cars represent Numbers 7451 - 7474 which saw use all over D&RGW / R.G.S. system. Our model kit is all Injection Molded Plastic including a remarkable one piece "brake rigging shot", our Nickel Plated Wheelsets and Genuine Kadee ®	Couplers! How are we doin' so far ? Any problems loading these web pages ? Click Here to email us your comments / suggestions ! Click the Icon above for a visit to PBL's Home Page ! This page and its contents are copyrighted material belonging to P-B-L circa 1996-2017 - All Rights Reserved.